In 2007, I and all other JPL employees were told that we would be required to submit detailed personal data and sign a release form allowing investigators to look at all aspects of our personal lives. Anyone who refused would lose their access to JPL; in essence, they would be fired. I, and many of my colleagues, found this appalling and quite unacceptable. ….Neither I nor any of the plaintiffs have anything to hide. I care nothing for my personal privacy. I care for the terrible damage being done to the guarantees of our Constitution. I care for the loss of trust most of us once had in our government. I care that the longstanding trust and collegiality between engineers and scientists at JPL and their management is being destroyed and replaced by a poisoned atmosphere of mistrust by employees and heavy-handed paternalism by management. I care that all across the country, many talented technical people will leave government service or choose not to apply in the first place because of this unwarranted assault on their constitutional freedoms. I fear that carried to its natural end, this process, with its false promise of national security at the expense of freedom, will forever damage our country. This is all part of the creeping normalization of the national security state. 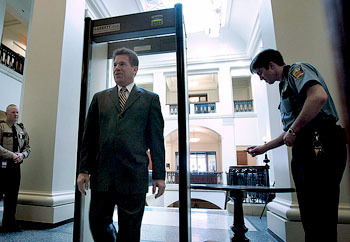 Not just airports, but metal detectors in every government building. Police officers who demand that you stop taking pictures of public places. Security cameras everywhere. Drug stores that make you sign a form to buy cold medicine. And in this case, a requirement that you sign away your privacy rights completely even if nothing you do is sensitive or classified or even remotely related to national security. We’re never going back to 1950. I get that. But as this stuff becomes ever more ubiquitous, we start to forget there was ever a time when we didn’t live our lives under constant surveillance and constant suspicion. We’ll regret that if we don’t take a deep breath sometime very soon.